To In much of Italy, a farinata is a thick porridge made with vegetables, broth, and finely ground flour of one sort or another. The coastal Italian region of Liguria's farinata is a quite different: It's a popular street food made with chickpea flour and enough water to make a fairly liquid batter, and baked in the oven into a thin, crisp cake: What emerges is a very tasty chickpea pancake or flatbread that you slice up and serve. Expect it to go fast, and for people to demand more. 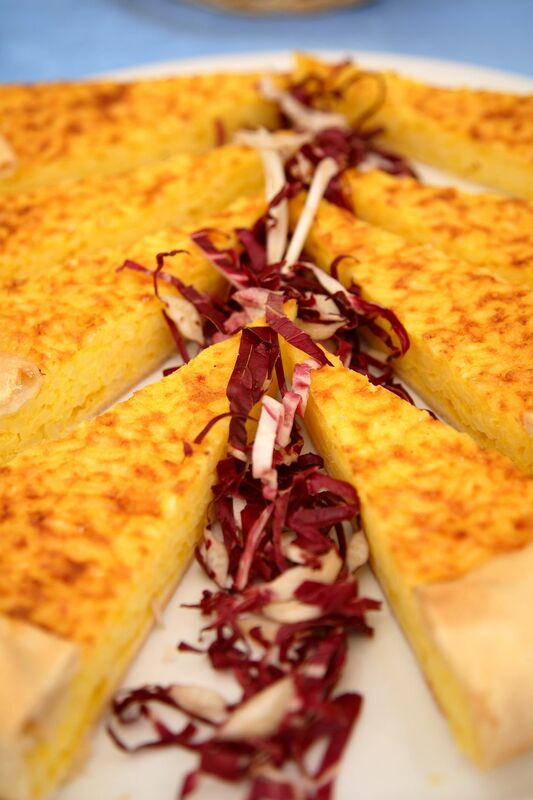 It is closely related to the socca of Nice, in southern France's Cote d'Azur region, and the cecina of Tuscany. The town of La Spezia was serving farinata in the street foods section of the 2010 Salone del Gusto, and in addition to serving it plain (and it was very good even plain), they were also serving it with sausages, casings removed and the meat crumbled over the farinata before putting it in the oven, and with creamy cheese, which was dotted over the hot farinata and melted wonderfully. Both mouthwatering options, though the plain farinata is very good too. Another classic option the folks from La Spezia weren't offering is ai cipollotti, with finely chopped onions, which are sprinkled over the farinata before putting it in the oven. Farinata is said to have been discovered after the battle of Meloria, between Pisa and Genova, when the victorious Genoese fleet was hit by a storm so violent the barrels of chickpea flour in the holds were broken open and mixed with the seawater that was coming in. When the waters calmed the sailors scooped up the mess -- they couldn't throw it away because it was all they had -- and spread it on the decks to dry. It was so good that when they got home they began baking it, calling it L'Oro di Pisa, Pisan gold. The final thing to note is that though this chickpea farinata is considered Ligurian, you will also find it along the Tuscan coast, where it is called cecina or torta di ceci, in the French Costa Azzurra, where it is called socca, in Piemonte (introduced by genoese traders), where it is called belecauda, in the Genoese colonies of Sardinia, where it is called fainè, and in Gibraltar, where it is called calentita. For this recipe, you will need 2 broad shallow pans with raised edges (if round about 15-inch, or 38 cm, in diameter, if rectangular, 10 by 18 inches or 25 by 45 cm. Put the water in a bowl. Use a whisk to beat the chickpea flour into the water, stirring briskly to keep lumps from forming. Whisk in a healthy pinch of salt too, cover the bowl with plastic wrap, and let it rest for at least four hours in a warm but not hot place. When the time is up, preheat your oven to 440 F (220 C). Use a slotted spoon to remove the foam that will have formed on the surface of the batter, and then mix in half of the oil, using the other half to oil your pans. Pour the batter into the pans -- it should be between 5 and 10 mm, or between 1/4 and 1/2 inch thick. Bake the farinata for 20 minutes, until it has firmed up and become golden. Slice it up and serve it hot, with salt and pepper to taste.